Secure Digital cards are ubiquitous in consumer electronic devices and have become the dominant means of storing several gigabytes of data in a small form factor. This new device is extremely compact but big on compatibility within the SD memory card family. The unit supports the very latest in memory card format, SDXC (Secure Digital Extended Capacity). 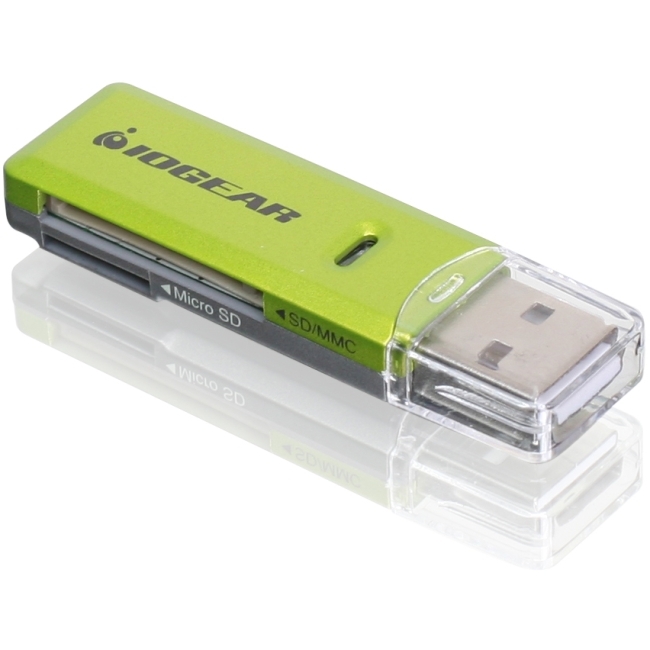 The SD/MicroSD/MMC Card Reader/Writer is a solution for hi-speed, bi-directional image and data transfer. Images and data can be transferred quickly from Secure Digital Card (SD), MultiMedia Card (MMC), or MicroSD memory cards to PCs or Macs. This is particularly useful in many applications, including digital cameras, video cameras, mobile phones, MP3, and other mobile devices. This item is an ideal way to bridge the gap between your desktop computer and other CE products. Just plug the product into your computer's USB 1.1 or 2.0 port and you are ready to go! This is a fantastic little card reader. Its not USB3 but it has it's purposes. It read my 64G SD card no problem and my microSD cards. It can only see one card at a time. It's compact size makes it great for travel. Use it for laptops or tablets. I will buy more of this reader. It's small. Cheap. Reasonably low profile. Easy to throw in my bag to have in case I need to transfer image files from a card to a PC. It may not be as fast as high-end readers, but it's reasonably capable. I got new camera(digital) and my computer didn't have a SD card reader built in. So i ended up buying this little adapter and it works well. I even plugged it into the back of my computer so its hidden. I purchased about 15 of these for my classroom. They work great so far. The only complaint I have is that they are somewhat difficult to insert into the computer. It is a little snug. I have tried buying cheap sd card reader/writers and they all either die on me or wont work with some sd cards. This unit is the best. It works all the time and every time. Works with all my SD and microsd cards. None - if all products worked this good I would be happy with them all. Rather than carry around a bulky, inconvenient USB cable with my camera, I just keep this little card reader/writer tucked into a mesh pocket inside the camera bag. Using this prevents needless wear and tear on the camera's USB port and its finicky, rubbery cover. Good speed. Ultra-compact. This is a very compact adaptor for reading SD and other cards. But I hope the slot for SD card is deeper so the card would shift around much, although that does not seem to affect the data transfer. Read and writes are decent, I like the fact there are only 2 slots, my only gripe is that it is not USB 3. Still highly recommended. I got 3 of these usb readers,for that price you can't go wrong for me they are the best.